President elect of the European Society of Retina Specialists (EURETINA), member of the Executive Board and chairman of the Teaching Committee of the same Society. 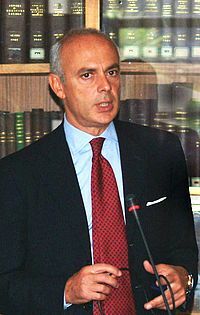 President of the Italian Society of the Retina (SIR). Dr. Bandello served as principal investigator in several clinical trials performed following ICH/GCP and mainly concerning age-related macular degeneration and diabetic retinopathy. Dr. Bandello is co-author of five books. He presented well over hundreds of presentations at different meetings. These primarily relate to retinal diseases; diabetic retinopathy; age-related macular degenerations; fluorescein and indocyanine green angiographies of different retinal vascular disorders. Dr. Bandello published 149 articles on Pub-Med journals mainly related to retinal diseases. Safety and efficacy of ranibizumab in diabetic macular edema (RESOLVE Study): a 12-month, randomized, controlled, double-masked, multicenter phase II study. Massin P, Bandello F, Garweg JG, Hansen LL, Harding SP, Larsen M, Mitchell P, Sharp D, Wolf-Schnurrbusch UE, Gekkieva M, Weichselberger A, Wolf S.
Intravitreal bevacizumab therapy on an as-per-needed basis in subfoveal choroidal neovascularization secondary to pathological myopia: 2-year outcomes of a prospective case series. Iacono P, Parodi MB, Papayannis A, Kontadakis S, Sheth S, Bandello F.
Bevacizumab vs photodynamic therapy for choroidal neovascularization in multifocal choroiditis. Parodi MB, Iacono P, Kontadakis DS, Zucchiatti I, Cascavilla ML, Bandello F.
Dexamethasone Intravitreal Implant in Patients with Macular Edema Related to Branch or Central Retinal Vein Occlusion Twelve-Month Study Results. Haller JA, Bandello F, Belfort R Jr, Blumenkranz MS, Gillies M, Heier J, Loewenstein A, Yoon YH, Jiao J, Li XY, Whitcup SM; Ozurdex GENEVA Study Group. Haller JA, Bandello F, Belfort R Jr, Blumenkranz MS, Gillies M, Heier J, Loewenstein A, Yoon YH, Jacques ML, Jiao J, Li XY, Whitcup SM; OZURDEX GENEVA Study Group. Intravitreal bevacizumab for subfoveal choroidal neovascularization associated with pattern dystrophy. Parodi MB, Iacono P, Cascavilla M, Zucchiatti I, Kontadakis DS, Bandello F.
Parodi MB, Iacono P, Papayannis A, Sheth S, Bandello F.
Posterior juxtascleral infusion of modified triamcinolone acetonide formulation for refractory diabetic macular edema: one-year follow-up. Veritti D, Lanzetta P, Perissin L, Bandello F.
Association between visual acuity and medical and non-medical costs in patients with wet age-related macular degeneration in France, Germany and Italy. Bandello F, Augustin A, Sahel JA, Benhaddi H, Negrini C, Hieke K, Berdeaux GH; MICMAC (MICro-economics of MACular degeneration) Study Group. Mitchell P, Bandello F, Schmidt-Erfurth U, Lang GE, Massin P, Schlingemann RO, Sutter F, Simader C, Burian G, Gerstner O, Weichselberger A; RESTORE study group.